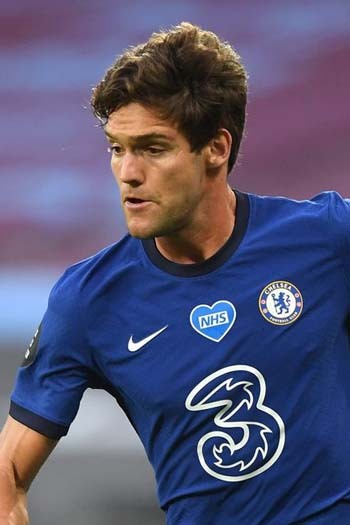 Born in Madrid, Marcos Alonso Mendoza is a Spanish footballer who currently plays for Chelsea FC. Alonso joined Real Madrid's youth set-up in 1999 and stayed with the Spanish giants through until 2010 when he made his first move to England, signing for then Premier League team Bolton Wanderers. Following a spell in Italy with Serie A team Fiorentina (when he also spent a brief period back in England, on loan at Sunderland), Alonso signed for Chelsea FC on 30th August 2016. Alonso was an integral part of Chelsea's Premier League winning side in the 2016/17 season, playing in the left wing-back position. He made 35 appearances, scoring 6 times in his first season with The Blues. Marcos has represented his native Spain at U19 level, but as yet has not been selected for the full international team. i.e. Marcos Alonso made 112 appearances for Chelsea, of which 1 were as a substitute.